My favorite Marine Corps picture. That picture and the Thucydides quote "He is best who is raised in the severest school" is on the doors of the guys in the Infantry Officer Course at Quantico. Happy birthday, devildogs, and a very happy Veterans Day. Thank God for those brave men. 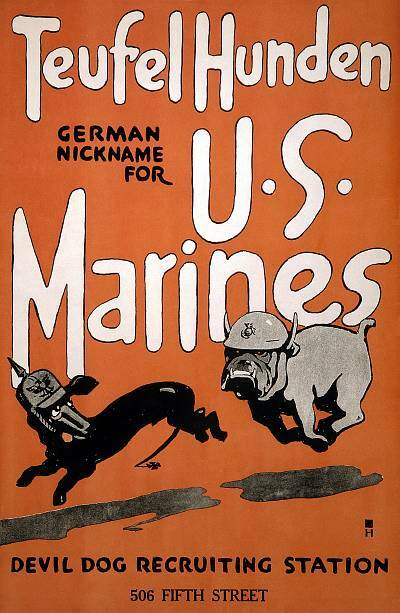 Andrew, I was reminded of your painting, your favorite Marine Corps picture, when I stumbled over this set of color photographs from WWI, by a German photographer. They are of men posed before destruction and so seem not as real as your picture. All the best to PFC Schramm. Thank you.